The one cuisine I deeply miss since getting diagnosed with Celiac disease is Chinese food. No more dim sum, no more chow fun, no more delicious meat-filled dumplings. Gone are the days of eating my way along the Dumpling Trail in Richmond, B.C. 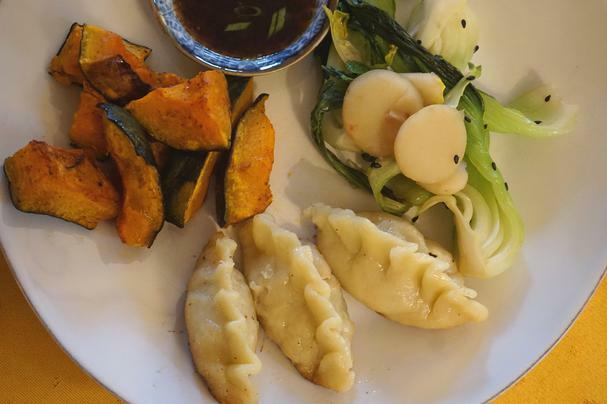 Though there are many gluten-free noodle options on the market, I have yet to find store-bought gluten-free wrappers to make pot stickers or wontons. Then I found Laura B. Russell's The Gluten-Free Asian Kitchen: Recipes for Noodles, Dumplings, Sauces, and More, a must-have cookbook for gluten-free lovers of Asian food. For those new to a gluten-free way of eating you'll find the section on identifying sources of gluten in common Asian ingredients (some ingredients are often sneaky like imitation crab (aka surimi), which contains wheat as a binder) and stocking a gluten-free Asian pantry indispensable. Her beautiful cookbook features an array of Asian recipes - Chinese, Japanese, Vietnamese, Thai, Korean - with chapters covering Sauces and Stocks, Skewers and Snacks, Dumplings and Savory Pancakes, Noodles and Rice, Vegetables and Tofu, as well as Seafood, Poultry, Meat, and Sips and Sweets. 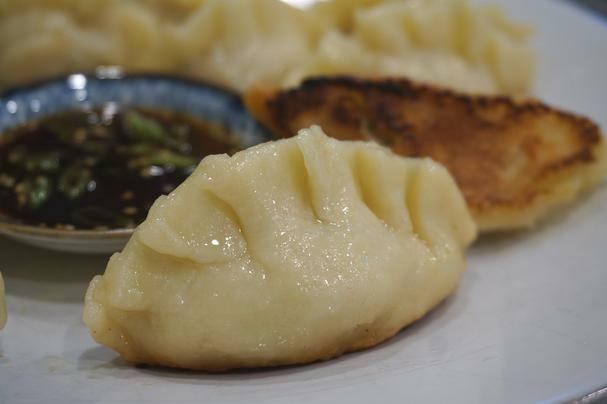 The following recipe is for Russell's Gingery Pork Pot Stickers (page 58). The trick, I found, in making the dough is to have plenty of sweet rice flour handy for rolling, otherwise, it can be quite sticky. Test a small piece before you begin as you may need to add a bit more to the dough. Stir together the tapioca flour, millet flour, sweet rice flour, xanthan gum, and 1/2 teaspoon salt in a bowl. Let the just-boiled water cool for about 30 seconds then add to the flours, stirring with a fork to combine. Add the cold water and mix well until a dough starts to form. With your hands, knead the dough a few times (either in the bowl or on a clean surface dusted with sweet rice flour). Form the dough into two balls and transfer to a large ziplock bag until ready to use. In a separate bowl, combine the pork, green onions, ginger, gluten-free soy sauce, sesame oil, remaining 1/4 teaspoon salt, and pepper. Mix well to combine. Dust your hands, counter and a baking sheet (or Silpat mat) with sweet rice flour. Roll one of the balls of dough into a long log about 3/4-inch thick. Cut the dough into 14 pieces and place them back into the ziplock bag to prevent the dough from drying out. Repeat with the other ball of dough until you have 28 pieces. Kepp about a 1/2 cup of sweet rice flour handy for dusting the counter and rolling pin. Working with one piece of dough at a time, flatten the dough into a circle with the heel of your hand, then, using a rolling pin or small dowel, roll the dough into a 3- to 3 1/2-inch circle, turning the dough to prevent sticking (you can also put the dough between two pieces of plastic and roll out). Transfer to a baking sheet and repeat with the remaining dough. Place one dumpling wrapper in one hand and add a scant tablespoon of pork filling to the center. Dip two fingers in water and run them along half the circumference of the wrapper. Lift the sides and fold to create a half moon shape. Gently pinch the edges to seal, then make 3-4 pleats. Place on sweet rice flour dusted plate and repeat with the remaining wrappers. Cover with plastic and chill until ready to cook. In a large nonstick skillet, heat 1 1/2 tablespoons of the oil over medium-high heat. Add half the dumplings and cook until lightly browned on the bottom, about 2 to 3 minutes. Hold the pan lid in one hand to control the oil from splattering, add 1/3 cup water, and immediately cover. Lower the heat to low and steam the dumplings until cooked through, about 8 to 10 minutes. Remove the lid and increase heat to medium. 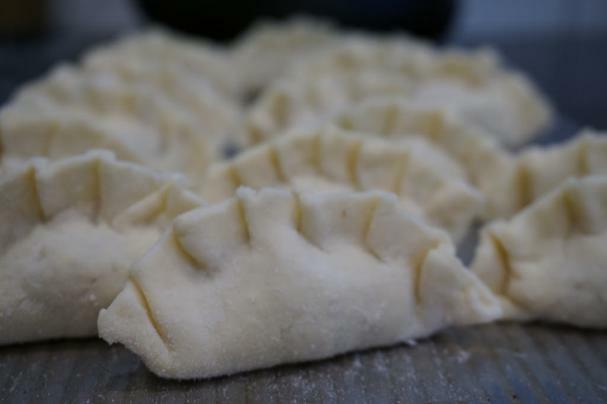 Cook until the water has evaporated and the bottoms of the dumplings are well browned, about 2 minutes. Repeat with the remaining dumplings. Serve with gluten-free soy sauce or a mixture of soy sauce, sesame oil, unseasoned rice vinegar, sesame seeds, and chopped green onions.